Synthetic peptide corresponding to Human SNAP25 aa 193-206 (C terminal). WB: Recombinant Human SNAP25 protein (ab51048), Human brain (cerebellum) and mouse brain tissue lysates. ICC/IF: SKNSH cells. IHC-P: Human cerebral cortex tissue. Our Abpromise guarantee covers the use of ab31281 in the following tested applications. WB Use a concentration of 0.03 - 0.1 µg/ml. Detects a band of approximately 26 kDa (predicted molecular weight: 23 kDa). ab31281 (1µg/ml) staining of SNAP25 in paraffin embedded Human Cerebellum. Microwaved antigen retrieval with citrate buffer Ph 6, HRP-staining. ab31281 negative control showing staining of paraffin embedded Human Cerebellum, with no primary antibody. ICC/IF image of ab31281 stained SKNSH cells. The cells were 100% methanol fixed (5 min) and then incubated in 1%BSA / 10% normal donkey serum / 0.3M glycine in 0.1% PBS-Tween for 1h to permeabilise the cells and block non-specific protein-protein interactions. 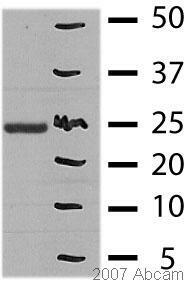 The cells were then incubated with the antibody ab31281 at 5µg/ml overnight at +4°C. The secondary antibody (green) was DyLight® 488 donkey anti- goat (ab96931) IgG (H+L) used at a 1/250 dilution for 1h. Alexa Fluor® 594 WGA was used to label plasma membranes (red) at a 1/200 dilution for 1h. DAPI was used to stain the cell nuclei (blue) at a concentration of 1.43µM. ab31281 at 2.5µg/ml staining SNAP25 in human cerebral cortex tissue section by Immunohistochemistry (Formalin/ PFA fixed paraffin-embedded sections). Tissue underwent antigen retrieval in steam with citrate buffer (pH 6.0). The AP-staining procedure was used for detection. Publishing research using ab31281? Please let us know so that we can cite the reference in this datasheet.